If Obama is honoring his promise, he is also missing his target. The biggest unmet recovery issue is housing, particularly for low-income residents. It is the most glaring omission in the renewal of New Orleans city life. You can drive by blocks of blight that are either the consequence of the floods — or were like that before the storm. In the areas where the city’s “Big Four” housing projects once stood, you find, at best, partially completed (though posh) mixed-income housing developments or, at worst, gated fields of weeds. Only 78 percent of the city’s pre-Katrina population has returned. The percentage of African Americans has dropped from 66.7 percent to 60 percent. New Orleans can now say it is less poor, but that’s because tens of thousands of low-income residents haven’t made it back to the city, and may never return. According to a report by the Greater New Orleans Community Data Center and the Brookings Institution, the number of people living below the poverty line in Orleans Parish (which encompasses the city of New Orleans) has dropped by 68,000 people. Read the article, it’s important. 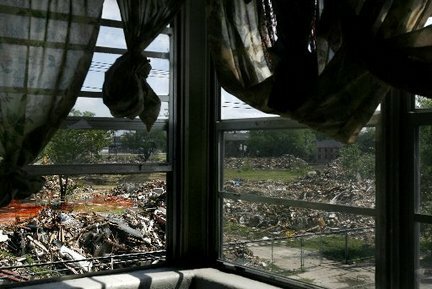 Has Obama Kept His Promise to New Orleans?